FAQ: Why should I dice gel bands? 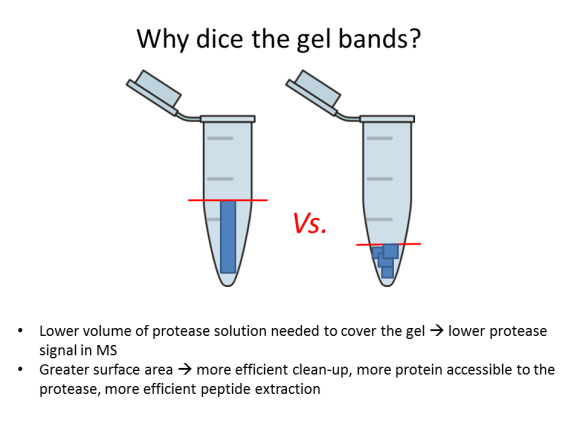 This entry was posted in In-gel digestion, Sample preparation questions and tagged in-gel digestion, protein identification, protein separation, sample clean-up, SDS PAGE, submitting samples on August 13, 2015 by Tania. Samples for Biotyping can be submitted Monday through Thursday by appointment only. Protein samples are prone to degradation and must be analyzed as quickly as possible. Please email or call at least one day ahead of preparing the samples to confirm that the instrument and the operator will be available when your plate is ready. The list of supplies and basic protocols for Biotyper can be found at the end of this post. In addition, the Biotyper manual in pdf format is available upon request. The Facility does not provide any of the supplies on this list and can only accept MS-ready target plates. For a demo on preparing the target plates, contact Tatiana. To expedite your analysis, please fill out the Excel Sample ID Template with your sample names exactly as shown. All missing or incorrectly filled sample names will be replaced by the analysis date and your initials. You are responsible for keeping a record of your sample positions. The Excel file with the sample IDs must be emailed to Tatiana. Please attach any other information as separate files or documents. It is very important to exactly follow the procedure and use only the fresh, specified-grade reagents and solutions. MALDI is a competitive ionization process and is very sensitive to contaminants commonly present in histology-grade solvents and low-purity chemicals. More is not better. A correct ratio of matrix to analyte is critical and achieved by following the procedure exactly. Tube extraction (formic acid extraction) procedure requires extra few minutes of the prep time but yields much better results than the direct transfer procedure. Direct transfer procedure requires practice and is only applicable to non-spore-forming microorganisms. We recommend following the tube extraction procedure for all samples. If you have any questions or suggestions or would like to discuss your project details, please email or call Tatiana. Plates can be shipped overnight on wet ice packs. To protect the sample spots, place the target plate facing down into its original box. You can tape it, so it does not get dislodged during shipping. This entry was posted in Biotyper, Sample preparation questions and tagged MALDI Biotyper, microorganism identification, submitting samples on August 13, 2015 by Tania.